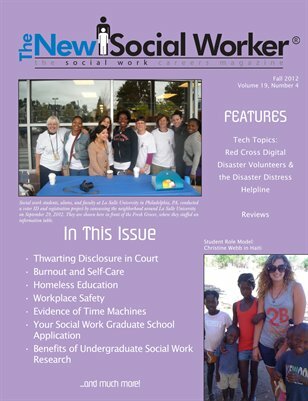 The New Social Worker Online Blog: Fall Is Here and So Is The Fall 2012 Issue of THE NEW SOCIAL WORKER! Fall Is Here and So Is The Fall 2012 Issue of THE NEW SOCIAL WORKER! I am pleased to tell you that the Fall 2012 issue of The New Social Worker magazine is now ready to download! It is available, free of charge, in PDF format, directly from The New Social Worker Web site. To download the Fall 2012 issue, go to The New Social Worker's download page. Then click on "Download." If the file opens in your Web browser, just click on "Save a Copy" or "File>Save Page as" and save the file to a location on your computer's hard drive. PLUS…watch our slide show of social work students in action—advocacy style! As you know, this year is a presidential election year, and I have heard of many social workers and students (like the ones on our Fall 2012 front cover from La Salle University) who have become involved in such activities as voter registration, advocacy regarding voter ID laws, campaigning for candidates, and the like. As social workers, we have ethical responsibilities to clients, colleagues, practice settings, and the broader society. I encourage you to review the NASW Code of Ethics, and then think about which candidates’ positions are in line with our ethical responsibilities to society. Be an advocate by being involved! Don’t forget to cast your vote this November. If you are looking for a professional social work job, or looking to hire a social worker, be sure to visit our online job site, SocialWorkJobBank.com (http://www.socialworkjobbank.com) today. Employers, please contact me at lindagrobman@socialworker.com with any questions about posting jobs on the site.